Being a brain tumor survivor can be lonely and scary for many, but one of the great things that has come out of this ordeal is that it gave me the chance to meet patients and survivors like myself, and to talk with them about their stories. As I mentioned a few posts back, I wanted to offer up the opportunity for guest posts from some of the people I’ve met along the way. Amazingly, and as you’ll read, the lyrics from the song we all heard time and time again growing up “it’s a small world after all” is true. This entry below is from an incredible survivor and person, Aisha. When Chris asked that I title my post with the title of a song, naturally I thought of Jill Scott’s “Golden”. Along with “Happy” by Pharell, Golden was often heard from my room in rehab. If you happened to walk by, you’d find me jamming in my wheelchair, basking in the sunlight pouring into my room. The powerful words inspired me to keep hope and my resolve in face of a difficult situation in my life. My story started off benign from the beginning. No symptoms, no emergency. My tumor, or lesion as it was defined at the time, was an incidental finding on a routine CT scan following a concussion I sustained from a slip on black ice, early one dark winter morning. Months later, after four consultations, surgery was advised and I agreed. 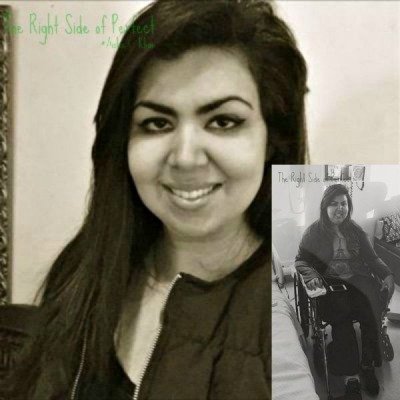 I underwent an elective neurosurgical procedure in which my tumor was removed in its entirety; however, a few days later I woke up completely paralyzed on right side. In many ways, it is then that I truly feel my brain tumor journey began. I was admitted to a stroke unit in rehab and remained there for two months after which I was transferred home. I struggled to learn to walk again, write my name, and do simple grooming. There was a time when I was in rehab that I was discouraged from working or even applying, but it remained my goal to work again and by the grace of a higher being, I was able to do so. I am now employed as an assistant academic director/assistant professor of health science for a graduate program. This May, during brain tumor awareness month, I will celebrate my 2nd anniversary since surgery and it will have also been two years of therapy. In addition to the personal connection I have with Golden, it also connects me with Chris. After my discharge I still had great difficulty with walking and unfortunately was unable to attend a concert featuring Broca’s Area, a CT band in which Chris’ brother is the drummer. They were fundraising for brain tumor awareness and the article was the first time I learned of Chris Cusano, a guy around my age, from my town, and amazingly with the same rare benign brain tumor as me, a central neurocytoma. I didn’t actually meet Chris until several months later at a CTBTA meeting. Shortly after our first meeting, I attended my first CTBTA event, Laughter on the Brain, in Hartford, CT. My attendance that day was truly a blessing as I could not drive yet and my father surprised me at work. He drove me from Bridgeport, CT all the way to Hartford, CT. After I arrived, I remember registering for the event and making my way downstairs where they were serving refreshments and a performance by Broca’s Area was going on. As I was making my way down, I heard a familiar beat playing in the background and found myself grinning ear to ear. It was my song, Golden. I heard a beautiful voice on the mic, a performance Jill Scott herself would approve of. It was Kismet: my unexpected arrival, my first CTBTA event with Chris, and my song was playing. Through Chris, I met his beautiful wife Ashley and the Cusano family. As we stood by the bar listening to the band, I felt gratitude to have recovered enough to be able to hear my song live and to have found a friend in a fellow survivor. Although I have always considered myself fortunate for having the tremendous support of my family and friends, to have the support and validation of another survivor is priceless. They say “birds of a feather, flock together”, and I feel this is very appropriate for anyone who has suffered from a brain pathology such as a tumor. Through the CTBTA, I have met numerous other brain tumor survivors and recently and more specifically, “benign” brain tumor survivors. Hearing your struggles as they are experienced by another individual provides a sense of validation that is difficult to find with caregivers and clinicians. After all, even I get tired of telling my friends, family, and even coworkers how my shoulder is sore or my leg is angry. Often I’ll joke that my left leg has requested a trial separation as it feels that it picks up too much of the work for the right. With Chris and CTBTA survivors, I could joke and hear their experiences and feel that “aha” moment. I walked away thinking, “yes, they get it”. So now, I feel honored to be a part of a unique group of individuals who have been impacted by a brain tumor. We may be weathered by the experience but we have not exhausted our resolve. In fact, each of us has in some way decided to share our experience in case our struggle may resonate with someone else. True, the path has at times been difficult, but the memorable associations I have made along the way give me reason to smile and the strength to continue “living my life like its Golden”. We hear about it all the time filling the airwaves, social media and conversation. You’d be hard pressed to say that there’s anyone out there whose life hasn’t been touched by it. My own family has been affected by cancer – as I mentioned before on this blog, my mother is a breast cancer survivor and the strongest woman who I have ever met – she even managed to raise me! When I received my brain tumor diagnosis, the one blessing bestowed upon me was that the doctors thought it was likely benign. A malignant tumor would have presented so many more challenges than I was already facing. Just as with any type of cancer, brain cancer is awful. There’s no denying that fact. I thought maybe it was just me, but it seems to be a common thread among benign brain tumor patients to feel a sense of guilt in opening up about their struggles due to our benign status. Trust me, we are grateful and while we do consider it a stroke of great luck to not have encountered the big ‘C’ in our journeys, our benign tumors have presented us with unique challenges which we will deal with for the rest of our lives. This past Saturday, I met up with three truly remarkable, inspirational people from right here in Connecticut who have gone down the same path I have – Rob, Aisha and Julia. All three were diagnosed with benign brain tumors. As we sat around the table for coffee, sharing our stories, I felt the connection of togetherness and pride in that while we may each have undergone a traumatic experience, we are still here and able to share our stories. The scars on our heads cannot take away our ability to live and sometimes even important, to laugh. This meeting was something I had wanted to do for a while, to reach out and talk with others in the same situation like I am. Now, I do not want to take anything away from anyone with brain cancer, or any other form of cancer – I hate the thought of it. But hear me out. Being diagnosed with a benign brain tumor and having it removed is not the end of the struggles, unfortunately. If you been following my story, you know my continued struggles and the additional surgeries and procedures that were needed. However, I am very fortunate in the grand scheme of things – something which I have known for quite some time, but which I sometimes forget to appreciate. The four of us each had to fight to regain our livelihoods, which included intensive rehabilitation and requiring us to put our lives on hold. Pre-brain tumor, Rob created a very successful life for himself. He spent years in the music industry, working as the tour agent for musicians including Britney Spears, the Backstreet Boys, Justin Timberlake, Mary J. Blige and most recently, the Jonas Brothers. Unfortunately though, in November 2012, Rob’s life changed forever when he was diagnosed with a brain tumor on his brain stem and spent nearly 200 consecutive days in various hospitals. During that time, he underwent 9 surgeries and countless hours of rehab. He developed hydrocephalus and now lives with a shunt. He still experiences double vision and is restricted to driving during the day. However, Rob is full of hope and is an inspiration to me and everyone around him. I have been in Rob’s company on several occasions now, and despite his challenges, not once have I heard him complain about his life or feel sorrow for himself. His doctors will continue to monitor the remaining tumor that is left on his brain stem and his hydrocephalus is under control with the shunt. Aisha, whom I’ve previously mentioned on this blog, was diagnosed with the same type of tumor as me – a central neurocytoma. Ironically enough, she grew up and lives in North Haven, CT, the same town that I grew up in and come to find out, in very close proximity to where I used to live. Like me, she was treated at Yale-New Haven Hospital and her prognosis is good. Aisha is a spirited and hysterical individual with a tremendous outlook. She shared a story with us of how she applied for a teaching job at the University of Bridgeport and was called for an interview while in the hospital. Determined, she asked if she could interview via Skype. While she did not Skype with them, she did end up going for an interview five months later when she was home and recovered, and was the successful candidate for the search. Despite her fortunes, Aisha is left with paralysis on her right side, requiring a cane to enable her to walk. There’s no stopping her though – she doesn’t let her challenges bring her down. She truly lights up any room with her positivity. Julia reached out to the CTBTA seeking to volunteer and help our organization – not to mention, she is full of wonderful ideas! A phenomenal personality and pleasure to meet with, I knew she was committed to this cause from the moment we exchanged our hellos. Before her diagnosis, Julia was experiencing headaches and loss of smell, which she believed to be a sinus issue. Unfortunately, she was diagnosed with a meningioma and underwent a craniotomy and then again surgery for a CSF leak and infection she developed. Julia has since lost her sense of smell and can only taste certain things, but certainly has not lost her sense of humor! During our meeting, she asked the rest of the group about our screws. Yes, screws. Julia pointed to a spot at the top of her forehead and another one above her right eye where the doctors inserted screws to place her skull back in. When I reached out for her consent to share her story with you, she referred to herself as “part bride of Frankenstein, nuts and bolts and all!” Despite her sense of humor however, she expressed frustrations with her memory and fears of neuropsych testing, all while waiting for a decision on her disability. Yet, in the eyes of a seven-year survivor, for someone who is only seven months out, I think she’s doing remarkably well! I think the four of us would all agree that joining together and sharing our stories – the pain, the struggles, and believe it or not, the belly-hurting laughs, was a great experience. There’s just something about the camaraderie felt between those sharing similar experiences that is therapeutic. So yes, while a cancerous tumor certainly is not the same as a benign tumor, tumors are tumors and they each present their challenges and obstacles. It is my hope, at least, that together we will bring all brain tumors to the forefront – both cancerous and benign. Because after all, grey matters.